Posted on February 16, 2015 by Squid, Inc.
After years of public begging from all corners, Marvel Studios and Sony Entertainment have come to an agreement on the rights to Spider-Man. Spider-Man has been a part of almost every major Marvel crossover storyline, going back years, and much of the anticipation over this deal has been about his inclusion in a film version of the “Civil War” storyline. It’ll be great to see Spidey out there as part of the MCU. While I’m not entirely thrilled about many of the implications, it does give me the opportunity to talk about Captain America: Civil War and Spidey. First of all, in case you don’t know, in the Marvel Comics (Earth-616), “Civil War” is the story of the “Superhuman Registration Act,” which aims to register and regulate superheroes, and the actions Marvel heroes take either in support of or opposition to the Act. 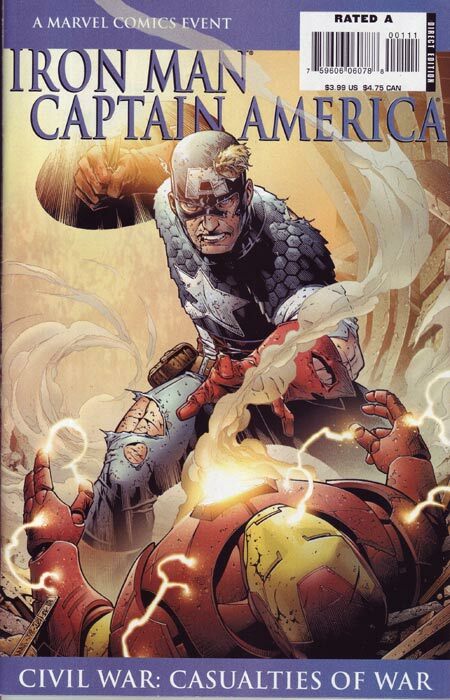 While the story is spread across the Marvel Universe and in the pages of titles from Fantastic Four to Punisher: War Journal, generally, the conflict is framed around three popular superheroes—Iron Man (Tony Stark), Captain America (Steve Rogers), and Spider-Man (Peter Parker), respectively for, against, and caught in the middle. The series itself was wildly popular, though not universally critically acclaimed. When I was a kid I liked it when Captain America saw a high government official commit suicide. I thought that was way deep, man. But I never go there when thinking about Watergate. While Mark Millar’s Captain America and I may both worry about civil rights and the dispensation of power in the United States, the moment this leads Cap to take out a battalion of Secret Agents to buttress his point he’s kind of lost to me as a potential partner-in-ideology. These two suddenly different characters with Peter Parker as their conscience? Come on. Because of troubling decisions like these, the Civil War storyline seems to dodge genuine thoughtfulness, and therefore remains, at best, a haphazard swing at the issue which was a better analysis of tribalism among the superhero set than its stated subject. It is not necessarily impossible to achieve more depth with such stroies [sic] in the comics. It simply needs first to be understood that the special effects, action and adventure hype priorities being focused upon presently, must eventually take a back seat to the more pertinent story content. For sociopolitical commentary to be effective, it must first strike a cord of sincerity currently lacking within the commercial marketing zeal that mainstream comics operate under. I’m a huge fan of spectacle: a larger-than-life feeling in (some of) my comics, and my movies. I loved Avengers, but there’s an undeniable level at which maintaining a broad appeal to the often boring, conservative, textualist parts of the consuming market overtakes better, more compelling, and more diverse artistic choices. Just as this created trouble for the Civil War Event (and may do the same for the film), it leaves me with the solemn certainty that my dreams for Spider-Man will go unrealized. I had imagined that one day in the future, they would reboot Spider-Man, and, as they have with other MCU films, base the material primarily on the Ultimate Marvel Universe (Earth-1610). I had hoped that one day the new Spider-Man would be Miles Morales, the young Afro-Latino legacy Spider Man with the red-and-black costume who was influenced by Donald Glover. However, as we know, the new MCU Spider-Man will be Peter Parker, and that’s disappointing. It’s disappointing because Spider-Man has been white for over half a century’s worth of comics and at least five films. To continue blindly with Peter Parker is to beat a dead horse for which they are running out of ideas about how to beat it. Miles Morales is a more compelling, better Spider-Man because he’s the best of past, present, and future. He’s still a wall-crawling, web-slinging badass, he understands the nature of loss and agonizes over every decision, he has a large part of Peter’s rogues gallery, and more. He has everything that we need in a Spider-Man. He’s well-liked, his issues sell, and he’s gotten plenty of press. His name, heritage, and phenotype reflect more and more what the United States looks like, especially in New York City, and he’s not bound by the weird web of annoying romantic garbage that Peter Parker is bound by. I’ve heard no cogent argument for why Peter is a better Spider-Man than Miles, and what I have heard usually either takes the form of complaining about forced diversity or extolling Peter Parker’s classic status. First, forced diversity is nonsense, whether someone thinks it’s behind the casting of Michael B. Jordan as the Human Torch or having a Black Spider Man. The world is getting more diverse; America is getting more diverse. What’s forced is how white our superheroes remain in the face of changing demographics. As far as being “classic” goes, age is an argument for something’s inclusion in a museum, not for its continued existence. 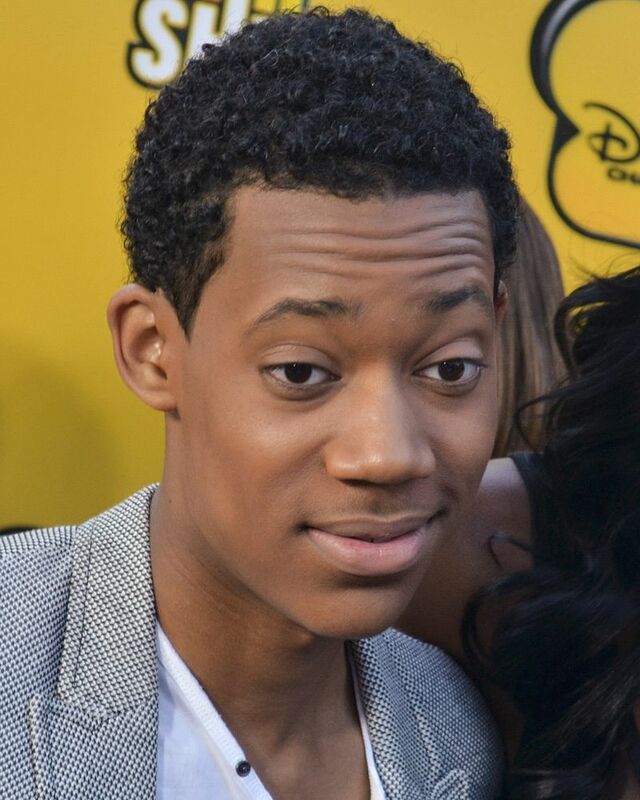 Now, it is entirely possible that Marvel and Sony will make the choice to take a genuinely “new creative direction” and cast a more diverse actor, like Donald Glover or my current favorite, Tyler James Williams. I don’t see that as likely. If that occurs, you have my word, I will eat a hat. I don’t even wear hats. I will buy a hat and eat it. But, most casting rumors revolve around actors who are exceedingly white. I’d be very pleased to be wrong. But I’m not. What makes that especially obnoxious is that it means that planned and slated MCU overtures toward diversity, namely Black Panther and Captain Marvel, will be pushed back to include another white male superhero in Marvel’s Phase 3 projects and Sony’s new movies. Civil War is itself risky territory for Spider-Man. The movie will be Chris Evans’s last solo turn as Captain America, which means there is all sorts of wrap-up that needs to be done in terms of Bucky Barnes. A glance further down the cast list illuminates the problem perfectly: Black Panther, Falcon, Black Widow, Iron Man, and now Spider-Man are all slated to appear in the film, and that’s just the heroes. Five or six heroes is the same numbers as in The Avengers, where there really wasn’t time to introduce a new hero. 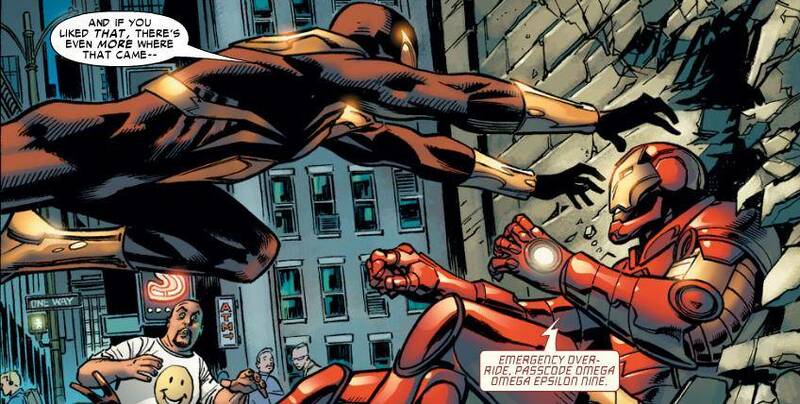 Civil War is supposed to introduce both Black Panther and now Spider-Man. What might have been a tight fit for T’challa will now (almost certainly) mean that he is overshadowed by the new Peter Parker, who is supposed to play conscience to Stark and Rogers. Worst case scenario: yet again, a Black hero is shut out or minimized to make space for a white hero, one who has already seen his silver screen time. Specifically, “Marvel’s “Black Panther” will make its way to theaters on July 6, 2018, and Marvel’s “Captain Marvel” on November 2, 2018.” That is to say, they will debut about a year or so after the new Spider-Man film, on July 28, 2017. I’m never not excited to see Spider-Man, but I can’t help but see this scheduling switch up as a shame, and the result of creatives and executives unwilling to take the right kind of chances. 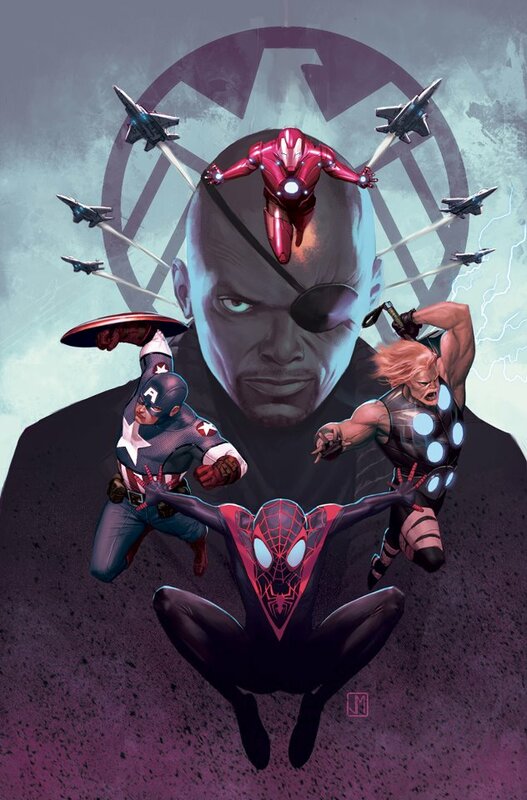 This entry was posted in Avengers, Comics, Marvel Comics, movies, opinion, Racial Issues and tagged Black Spider Man, captain america, civil war, Iron Man, Marvel, MCU, miles morales, peter parker, race, Spider-Man, ultimate spider-man by Squid, Inc.. Bookmark the permalink.